Chocolate Poppy Seed Cake Recipe - Let the Baking Begin! 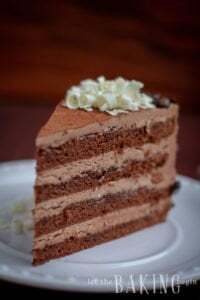 Chocolate and Poppy Cake Recipe is layered with sweetened condensed milk buttercream and covered with light whipped cream. 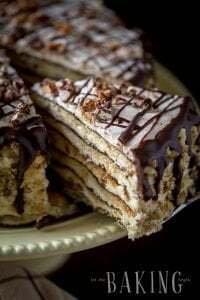 This Russian cake has been a favorite for many years and once you make it, I’m sure it will become yours too! 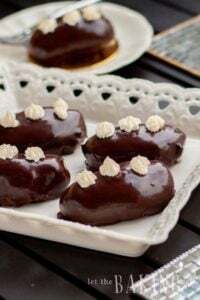 This Russian cake is known by the many different names including Black Prince, Russian Royal Cake or Bottom of the Ocean. I’ve found that almost everybody who lived in Russia has some variation of this cake recipe and that is not to say that Americans don’t. You can find similar recipes, with the only difference being that sour cream is sometimes replaced by yogurt, sometimes buttermilk, others decide to substitute it with vegetable oil. And no wonder it is such a popular cake worldwide – it definitely is one of the best tasting cakes. Dense, moist with a certain creaminess from the condensed milk frosting, or as I call it – Russian buttercream. 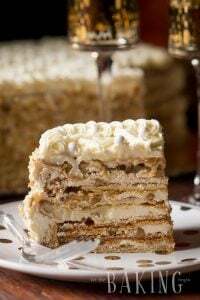 The versatility of the cake layers is also another reason this cake is popular in the Russian community. Each layer can be different, depending on what you want to add to it. You can make your cake all chocolate, or all poppy seed, or all raisins, or all white vanilla cake, or alternate the flavors of the cake layers to your liking. I used only poppy seeds and chocolate, but you’re the boss of your cake, so it is up to you! Just replace the amount of poppy seeds with an equal amount by volume with dried cranberries, raisins or chocolate chips. When giving somebody a recipe, I always say that if you’ve never baked a thing in your life you can still make this cake, it is that easy and straightforward. The original recipe does not call for additional frosting for decorating the outside of the cake, but I always find that given frosting is only enough to layer the cake and make it delicious. I always add 2 cups of whip cream (whipped to stiff peaks) to decorate the outside of the cake. You can do the same, or you can omit this step and just reserve 1 cup of frosting before starting to layer the cake, for covering the outside. This recipe uses Russian Buttercream you can read about, here. Creamy Blackberry Cheesecake Tart – Creamy flan-like Cheesecake Tart with Blackberries. Perfect Chocolate Sponge Cake – Recipe for the best chocolate cake. Swirl Rose Box Cake – Beautiful swirl rose cake. Preheat oven to 350F. Apply some butter to the inside of two 8-inch round baking pans and dust with flour. Shake out the excess. Alternatively, you can spray them with nonstick cooking spray or line with parchment paper. Fasten the wet cake strips around the baking pans. Set aside. Whisk 2 eggs with a 1 cup of sugar, add 1 cup sour cream, 2 teaspoons baking soda mixed with 2 tablespoon vinegar, ½ cup flour and 1 cup poppy seeds thoroughly until smooth and creamy. Then, divide evenly between the two prepared pans. Bake until a toothpick inserted in the middle comes out clean, about 20 minutes. 3rd and 4th layer - Follow the instructions in step 3, but replace poppy seeds with 2 tablespoons cocoa powder. Invert the cakes onto a wire rack and let cool. If you'd like thinner cake layers, split each cake layer horizontally into two even layers with a long serrated knife. In a bowl of a mixer fitted with the whip attachment, whip the butter for about 5 minutes on high speed, scraping down the sides several times throughout. With the mixer still running, slowly pour the condensed milk against the inside wall of the mixer bowl until fully incorporated and fluffy. As soon as the condensed milk is added, with some streaks of the condensed milk still showing, turn the mixer off and fold the frosting until fully combined. How to cook the sweetened condensed milk. Remove the labels off the cans, place it in a deep pot and cover with water so that the water covers the cans at least 2 inches. Cover with lid and bring the water to boil. Cook over medium heat for 1.5 hours. Do not let the water evaporate and add hot water as necessary to keep the cans submerged at all time. Take off the heat and cover with cold water until the cans are cool. Place a dab of frosting on a serving platter. Top with the first cake layer and press to adhere. Spread 1/3 of the frosting into an even layer, then repeat with the rest of the cake layers and the Russian Buttercream. Whip the heavy cream with a mixer fitted with a whip attachment. Add the powdered sugar and vanilla extract and whip to incorporate. Whip until the cream is fluffy and there are visible ripples as the whisk is whipping. Do not overwhip or the cream might separate. If you see the cream start to separate, add a little bit of unwhipped cream and carefully mix until smooth again. Cover the cake in the prepared whipped cream decorate to your liking. Refrigerate the cake overnight. Serve at room temperature or cold out of the fridge, depending on how you like it. This recipe makes one 4-inch tall, 10-inch round cake. For 8-9 inch cake, use only 3/4 ingredients. Russian Buttercream - Let the Baking Begin! So to make an identical cake to your picture….. do i take the amount of ingredients in STEP 2 x 4??? So the ingredients portions in step 2 make one layer as pictured? Yes, you got that right. I am editing the instructions to make more clear. Let me know if you have any more questions! Hi Marina! So i was whipping the heavy cream and it started to look fluffy and then added sugar and vanilla extract. In a minute the cream become somewhat like cottage cheese. What did i do wrong? That’s what overwhipped whip cream looks like. You need to whip for less time. If you whip for too long, you will take your cream to a butter stage, that’s when solids and liquids separate and you get butter. Next time start to to add the sugar as soon the whip cream begins to thicken, and stop whipping when it just holds peaks. If you do overwhip, add a little bit of cream (liquid) and mix again, and it should come together again. If you beat too long though, it could be unrepairable. Wow! I made this cake today and it was absolutely scrumptious! ;) I rate 5 star! Keep posting amazing recipes Marinochka! Poppy Seed cake with Dulce de Leche Buttercream - Let the Baking Begin! Let the Baking Begin! 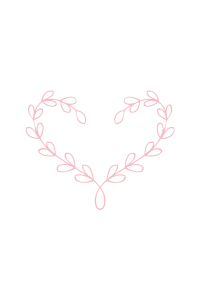 Hi, I absolutely LOVE your website! God bless you and keep up the awesome work! 🙂 Maybe I missed it but I don’t see a baking time for the layers in this recipe–? 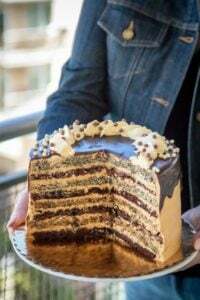 So for the cake that you photographed here, did you bake only 1 layer poppy seed and then 1 later chocolate? And then just cut each in half to get 2 layers of each? And how long do the layers bake approximately? If you have two baking pans then you can make the batter at the same time, then split it in two, add poppy seeds to one half and cocoa to another. Stir. Pour poppy seed batter into one pan and cocoa batter into another one. Bake at the same time. If not, just split the proportions in two and bake one at a time. You can follow instructions for baking times from the recipe, but as soon as a toothpick inserted in the middle comes out clean, the cake layers are done. To make a cake shown in the pictures (with 2 chocolate and 2 poppy seed layers) should I cut the entire recipe in 1/2? You said 3/4 in the beginning and I’m a little confused…. If you want to make a 6 inch cake, then split the recipe in half. for a 10 inch cake, do not change the recipe amounts. Hope this helps, if it does not, let me know. Marina Thank You for recepie. It’s so easy and fast. We had fun wiht kids, by making and than eating it too. for the cake in your picture, did you use cooked or uncooked evaporated milk in the frosting? It’s sweetened condensed milk, not evaporated milk. For the cake in the picture I used uncooked, but you can you either. I personally like it with cooked, but some of my family likes it with uncooked. It is indeed! Thanks for your comment! Wow what a lovely cake. Thank you for sharing. Looks like a holiday cake for sure!